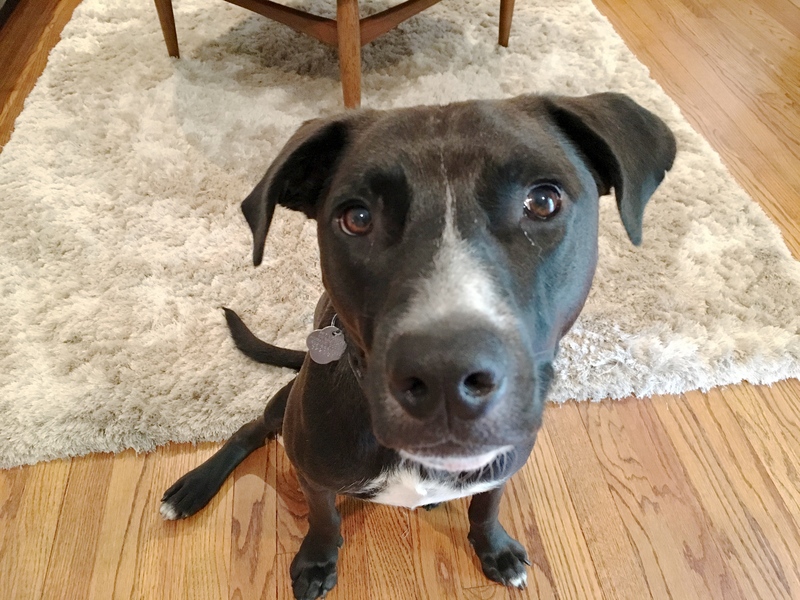 Jake is a one-year-old Lab mix who is originally from the Turks and Caicos Islands. Shortly after adopting him, his guardians noticed a gradual increase in some territorial behaviors; barking, lunging and nipping a few people who visited his home. His guardians scheduled a dog obedience training session with me to put a stop to this behavior. Because Jake had nipped a couple of people who visited his home, I met his guardian up the street a few houses away. Sometimes meeting a dog in neutral territory can help when it is territorial about its home. I used a couple of high-value treats to make sure that the greeting started off on the right foot. As we were walking back to Jake’s home however, he started to nip at the bag that I carry all of my dog behavior gear in. After putting the bag away, Jack’s behavior returned to normal. As we were continuing our walk, I noticed that Jake was pulling quite a bit on the harness his guardian was using so I decided to do a little leash training. I grabbed a Martingale collar and showed his guardian how she could add a special twist of the leash to stop him from pulling, and then we did a quick little segment on how to lead a dog on a structured walk. Having Jake walking next to or behind his guardians is one way that will help him adopt more of a follower’s mindset. This follower’s mindset will be an important part of his rehabilitation to stop him from acting territorial around the home. When we returned home, I noticed that Jake was not at all subtle when it came to asking for attention.He nudges or pawed at anyone he wanted attention from. He also showed no respect for his guardian’s personal space, shoving his way into position. I suggested number of rules that will enable his guardians to start correcting him in a more effective way. By consistently correcting him with good timing and appropriate intensity, his guardians can help him start to identify more as a follower inside the house. I suggested they also start claiming their personal space. While there is nothing wrong with a dog being near a human, the way Jake was doing it was somewhat possessive and showed little respect for them as authority figures. By asking the dog to respect a one or two foot bubble of personal space, his guardians can help him start to look at them more like authority figures. Because the family will be welcoming their first child home later this year and Jake liked to rush up and down the stairs ahead of them, I spent a few minutes going over an exercise that asks him to wait at the top or bottom of the stairs for permission to go up or down them. Consistently asking Jake to wait for the humans to get up or down the stairs before following is another great way to help him start to see and identify as being in a follower position. Because security for the pack is typically handled by the senior ranking dog, I wanted to show his guardians how they could take over door answering duties. I went over a set of escalating consequences that I like to use to disagree with a dog when it is doing something I do not approve of. Shortly after we finished, Jake’s other guardian returned home from work which gave us an opportunity to put these escalating consequences into a practical application; answering the door. It’s going to take a little bit of practice before Jake’s guardians are comfortable enough in the technique to deliver the disagreeing consequences with good timing. I suggested that they place some tape on the floor to outline the exact border that Jake is not to cross when there is a knock at the door. Another great way for a dog to stop reacting or engaging in an unwanted behavior is to train them with exercises that require the dog to exhibit self-control. I spent a few minutes going over a simple watch exercise that will allow Jake’s guardians to redirect him and help him practice focusing when (or preferably before) he starts to get out of hand. The above video is a short summary of some of the techniques that were outlined in Karen London’s (CAAB) book, Feisty Fido. If you have a dog that his leash reactive or lacks focus, I highly recommend you pick up this book. I also recommended that the guardians read the article I wrote for the paper a few weeks ago that includes several tips on how to successfully prepare your dog for the arrival of a new baby. By the end of the session, Jake was much more relaxed and seemed to be interacting with his guardians in a more respectful manner. He was looking up at them for cues and already starting to show respect for their personal space. It’s going to be important for the guardians to master the Watch exercise then start to practice it under varying and increasing levels of distractions. Combined with timely enforcement of the new rules should help Jake start to see himself as subordinate to his humans. Once this transformation takes place, his protective or possessive nature when guests arrive should stop. This is the case for three quarters of my clients. However, if Jake continues to show signs of territoriality or aggression when guests arrive a month or so after his guardians have had a chance to practice these techniques, they will need to contact me to schedule a follow-up session to incorporate even more specific techniques and exercises.